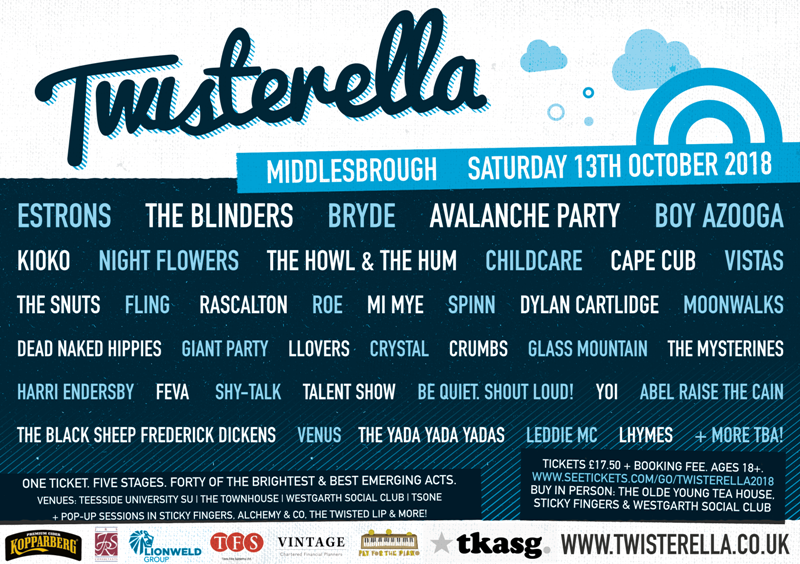 Arriving on Saturday 13th October, it’s another year of phenomenal bands and awesome artists for Middlesbrough’s acclaimed Twisterella Festival. Today sees the announcement of some hotly-tipped bands and the best emerging bands as the Festival continues its role as a champion of bands who are ready to make it big. Local favourites such as Avalanche Party, Cape Cub, Dylan Cartlidge and Llovers are lined up for venues across Middlesbrough, which also welcomes Estrons, The Blinders, Bryde, Boy Azooga, Kioko, Night Flowers, The Howl & The Hum, Childcare, Vistas, The Snuts, Fling, Moonwalks, Rascalton, Roe, Mi Mye, Spinn, Giant Party, Glass Mountain, The Mysteries and many, many more. Centred around Teesside University, the 1000 capacity multi-venue metropolitan music festival utilises established venues on Linthorpe Road & Southfield Road such as: Teesside University Students’ Union, The Townhouse, TSOne and The Westgarth Social Club, with some of the town’s most interesting bars in nearby Baker Street and Bedford Street also welcoming the musical talent on offer. Teesside University Students’ Union welcomes Bryde, The Howl & The Hum, Rascalton, Roe, Glass Mountain, Llovers, Be Quiet. Shout Loud!, Leddie MC and Boy Azooga. The Townhouse brings along The Blinders, The Snuts, Childcare, Spinn, The Mysterines, Abel Raise The Cain, Vistas and Lhymes. Westgarth Social Club isn’t to be missed too, with Avalanche Party, Night Flowers, Cape Cub, Mi Mye and Harri Endersby in the downstairs of the venue, while upstairs, you’ll find Estrons, Fling, Giant Party, CRYSTAL, Crumbs, Talent Show, YOI and The Black Sheep Frederick Dickens. TSOne gives its stage to Kioko, Moonwalks, Dylan Cartlidge, Shy-Talk, Dead Naked Hippies, Feva, Venus and The Yada Yada Yada’s. Tickets are on-sale now priced at £17.50 (plus standard booking fee) from the usual local outlets and online here.